Gary is Of Counsel in Stoll Keenon Ogden’s Lexington office. He is a member of the Real Estate Practice. Gary focuses his practice on transactional real estate, as well as commercial leasing. He also has extensive experience as lead counsel for major banks, developers, landlords and tenants. 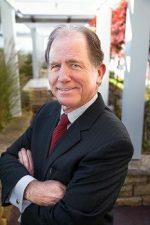 Gary is AV® Preeminent™ Peer Review Rated by Martindale-Hubbell®, is listed in The Best Lawyers in America®, recognized by Chambers USA and is honored as a Kentucky Super Lawyer for his many legal accomplishments. He has served on the program planning committee for the UK/CLE Real Estate Law and Practice Institute for many years. He has also spoken at a number of UK/CLE sponsored seminars on various real estate issues. Gary has further participated as a speaker at multiple firm-sponsored seminars on issues ranging from environmental considerations in real estate transactions to limited liability companies as borrowers in real estate transactions. Gary is a member of the Fayette County, Kentucky and American Bar Associations. Mr. Barr was educated at the University of Kentucky (B.A., 1974 and J.D., 1977). While attending the University of Kentucky College of Law, Mr. Barr was a member of Phi Delta Phi and of the Kentucky Law Journal. Gary has extensive transactional experience as lead counsel for major banks, developers, landlords and tenants. He also has extensive experience acting as local counsel to out-of-state lenders in connection with multi-state transactions which include Kentucky real estate, and as local counsel to out-of-state lawyers whose clients have Kentucky real estate holdings.